Lure ancient spirits to bargain for their power! Immerse yourself in the intricate rituals and legends of Goetian magic. Grab thick chalk, inscribe a geometric seal around yourself, and invoke the name of a terrible spirit to aid your quest. Behold! With a final intonation, you surrender to the spirit, and a quivering surge of power emenates from deep within. Are you ready? Embark on your journey, following steps once trodden by shivering demons and martyred titans, lost mortals and chastised gods. The vestiges of a hundred sundered souls lie at your fingertips, yours to command if you dare. This 336-page guide opens gateways to perilous and exciting adventures. Mere mortals who risked all to bind spirits have ascended to heroes, and you will too! For use in your fantasy d20 System roleplaying game. Requires the use of the Dungeons & Dragons Player’s Handbook, v3.5, published by Wizards of the Coast, Inc. Note: Radiance House has published a FREE conversion guide to update Secrets of Pact Magic for use with the Pathfinder Roleplaying Game. 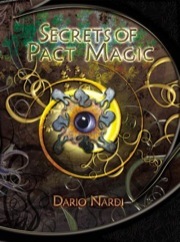 Any sign of the next Book: Villains of Pact Magic? It shows in stock from Radiance House's home page. I got my Villains book on Friday!!! I haven't had time to read it but flipping through makes me salivate! I got this pdf and now ordered the hardback. Top quality stuff! I really like all the pop culture references worked in so smoothly without disrupting the fantasy feel! But I'm wondering if Radiance House is planning a Pathfinder edition of these books? I've already downloaded conversion guide. There really doesn't need to be a full revision of the books, though I admit a new set of stat blocks for the various monsters in Secrets of and Villains of would be a nice thing to have. Yeah...the statblocks updated would be nice. And I would of liked to have the various shapeshifting powers updated to the Pathfinder standard. PF's polymorphing is just so much easier to use. Ahh well...like you said a fully converted book isn't exactly needed. The books coreclasses are pretty evenly balanced against PF standards.